Amazing glass for the money! Me too, I use 10x42- 12x15 and 15x56, For the money, they are amazing glass for the $$$. The spotter is next on my list! So, So cool. They are so much fun for bowhunters! Not to many with 20, well done! We are having a silent auction for a Javelina Shoulder Mount donated by Frank James Artistry. You can place your bid(s) at our upcoming Javelina Hunting Seminar on Tuesday, Jan 15 (info below) and will also being taking text or called in bids starting now up to noon on January 15, 2019. If you want to text or call in a bid for the Javelina Should Mount please text or call in your bid to 602-309-3430. Check out Frank James Artistry on Facebook. Special thank you to Doug, he donated two javelina shoulder mounts. One for Tuesday javelina seminar and the other for February javelina mentor camp. The javelina seminar shoulder mount will be under silent auction and given away at the end of the seminar. Please see below for the units needed, as CHA is the host organization. 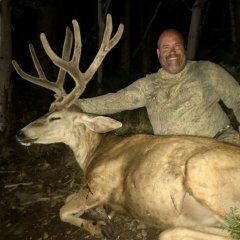 CHA will be hosting our annual Mentored Javelina Hunt in February and we are currently working with the AZ Elk Society - Heros Rising Outdoors/Hunts for Heros program to have five female wounded warriors in our camp. This will require five permit holders for the general javelina season in unit(s) 19A, 20A or 21 to donate there tags for the wounded warriors. (Hunt date: 2/22/19 - 2/24/19. Hunt #s 5006,5008 & 5011) CHA has been able to donate many tags to this awesome program in the past and we are hoping that some of you that have tags would be willing to give them up to support these incredible ladies that put their lives on the line and were injured serving our country. What is outside width of the tires?